OK, time to come clean, this is the project I’ve been inspired to create from discarded pallets. 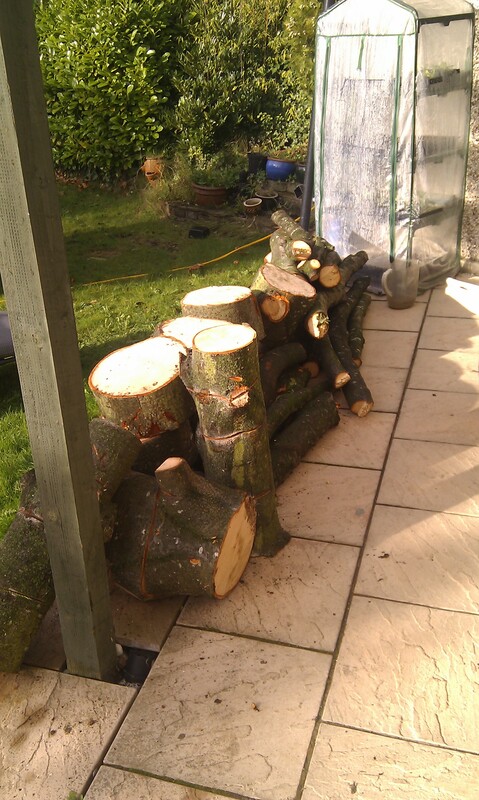 We’re looking at building a decent-size covered woodshed to hold all the firewood we’ll need once our woodburner arrives. I’m sure ours won’t be anywhere near as beautiful as the woodshed in this video. particularly as I’m going to try and make ours almost entirely from reclaimed timber, keeping the costs down to just fixings and waterproofing for the roof. When the council started taking down some of the large trees around our estate I asked the fellers for the mulch and logs from the closest. They were only too happy to oblige so we got a huge pile of mulch – now providing paths around the garden and protection to the orchard. The logs sat in a large pile while I asked for advice on what to use on them, and the advice came back that (beyond just a basic saw) I needed a splitting maul, not an axe as I was expecting. It wasn’t expensive – we got ours from the local Machine Mart – but it does an amazing job. A quick update to my post yesterday on Woodburning Stoves for Heating & Hot Water in Smokeless zones. I’ve just had it confirmed by Rayburn/Aga that they do no wood-fired boiler models which are suitable for smokeless zones. So that means that I should update my Bin your Aga – buy a Rayburn post to “Bin your Aga and Rayburn – A Dunsley Yorkshire’s the only one for me”, and it means I can kiss my prospects of a Rayburn Solar Thermal System goodbye too. Maybe it’s time to move to the country 🙂 or look for alternatives to a wood-fired stove for my back-up water heating. They cost £1922.30 for the wood-only version or £2218.40 for the multi-fuel. So, if we’re looking at a wood-fired top-up to our solar hot-water that the sort of outlay we’re looking at. The other consideration is overheating the house – if we succeed in super-insulating the house then having 4.5kw coming out of the Yorkshire into the room might cook us all! I’ll have to do the calculations, and look at how SIP and PassivHaus houses heat their hot water. Steadily firming up the shopping list for our new house – here’s the latest list, with links. Central Pendant light in diffusing shade – 12v CFL? Two Standard/Reading Lamps – 12v CFL? Mechanical Ventilation with Heat Recovery (MVHR) for everyday space heating. This is something we need to work out – our new house will be in a smoke control area. To check whether you’re in a smoke control area look up your local authority here. If you are then the only wood or multi-fuel burning stoves you can fit are listed on the exempt appliances list. It also explains what types of fuel you’re allowed to burn in them. In a surprise, Esse do not have any models on the list, but a quick check of their site shows that they have just launched (9th Feb) a new model that is OK in smoke-free zones. It’s the compact 100SE model – as shown in the photo! How much firewood should you store? Huge numbers of people are putting in Wood Burning Stoves, Boilers and Ranges at the moment. They’re doing this for a number of reasons: to beat rising gas and electricity prices, to reduce their carbon footprint, or to improve the resilience of their heating system in the face of peak-oil based supply issues. The first challenge appears to be actually getting hold of a stove – apparently Dunsley have a 6-month backlog on orders for some of their stoves, And Stovax reported a 50% increas in orders in the last quarter of 2008. Once you have your stove though, how resilient is it likely to be? Unless you have your own woodland you are dependant on a supplier – so will there be enough wood for everyone who is currently putting in a stove or range? Current UK consumption is about 1,180,000 tonnes a year. Only 1m of those are produced in the UK, so we’re currently importing 15% of our firewood needs. However, if you’re not fussy about what you burn, then there are 2.5m tonnes of burnable wood going to landfill every year – so if you see a skip full of random timber or broken pallets take it home and burn it – you’ll be helping the UK become firewood-independant. Demand is increasing at around 25-30% a year, and resulting shortages resulted in price increases of up to 30% at the end of 2008. The increase in demand is particularly resulting in an increasing supply of green, un-seasoned logs that will need to be stored for at least a year before being burnt. There are wide price variations across the UK firewood is most expensive in the North and West, and cheapest in the South East. The Government is working to bring another 2m tonnes of firewood to market by 2020. They say this will be enough to heat 250,000 homes (an average consumption of 8 tonnes/yr/house). With the current supply chain under significant stress, the easiest way to ensure that your wood-fired stove or boiler continues to provide heat is to make sure that you have stored enough wood yourself. The general guidance is that wood should be stored for a year to reduce its moisture content from the 70-50% it is when felled down to an ideal <25% for burning. If you haven’t been through a full season with your wood-burner yet the general guidance is that an average house will consume 8 tonnes a year – around 12 m³, depending on your level of insulation, how hot you keep the house, whether it’s also heating your hot water etc. So – how much wood have you got stored? Two months supply? Less? 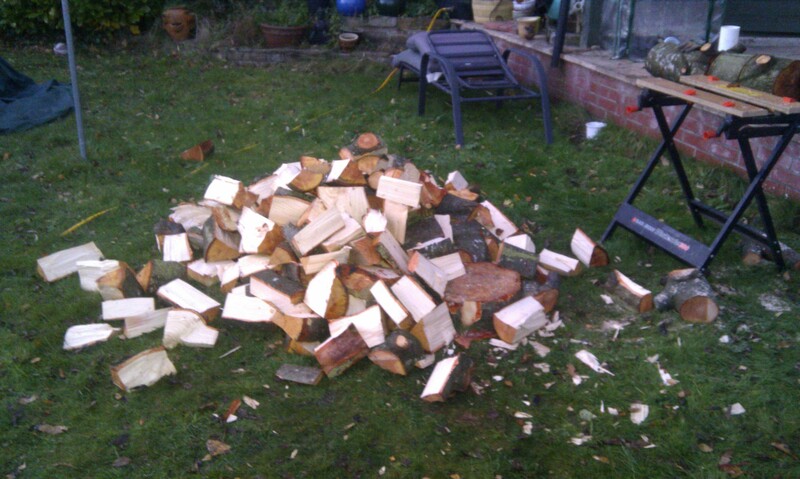 If your wood-burning stove is essential to your heating/cooking/hot water then you need to take wood storage seriously. Build a wood store – a shelter with a roof (clear if possible), open sides, and use pallets for the base and to divide sections to maximise airflow. Preferably split it into at least two sections so that you can have one section “seasoning” (drying) and one section that you are burning. Store the wood end-on to the airflow after chopping it to the right size for your stove. Make the stack as tall, long and thin as possible to maximise airflow. Do that, and your wood-burning range can provide a really resilient solution to your heating, hot water and cooking needs.